No 401(k) changes, Mr. President? Is that your final answer? Late Friday afternoon, someone let it slip to The New York Times and The Wall Street Journal that the GOP tax plan being drawn up in Congress would slash away at the tax benefits of 401(k)s.
And the details were more specific than anything we’d heard to date: The $18,000 annual contribution limit would be chopped down to $2,400. Any amount beyond that would be “Rothified.” That is, it would be treated like a Roth IRA — you’d pay taxes on it now, with the promise that the money plus any investment gains could be withdrawn tax-free in retirement. The president’s tweet notwithstanding, we daresay it’s not time to let your guard down. Maybe the idea’s off the table for now. But we’ve been chronicling proposals for “401(k) confiscation” as long ago as 2008. Future presidents and congresses won’t be bound by the current president’s tweet today. Remember under Reagan when the top tax rate was cut from 50% to 28% in the mid-1980s? That lasted all of three years — Poppy Bush jacked it up to 31% and Clinton pushed it to 39.6%. Meanwhile, if changes to 401(k)s are off limits, what will Congress do to ensure the tax package is “revenue neutral”? As it is, both Congress and the White House appear determined to eliminate the deduction for state and local income taxes and property taxes. What else might they do to “offset the revenue loss from a reduction in business tax rates that Republicans have put at the center of their plan”? The only thing that seems certain right now is a cut in the corporate tax rate. That’s the priority. Is your portfolio positioned accordingly? Learn how to take maximum advantage right here. That was the title of an article your editor posted at The Daily Reckoning 2½ years ago. Already we were noticing a twin phenomenon: Educated higher-earning Americans were working well past retirement age and continuing to contribute to the Social Security system… while poorer Americans who hadn’t graduated from high school were dying in growing numbers before they could ever collect a dime in benefits. 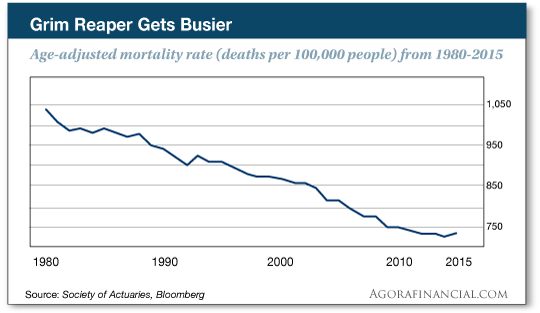 So… Social Security’s finances are looking a little better… but the government’s medical costs will only spiral higher. Which lines up with another one of our forecasts — 20 years from now, you won’t be able to count on the health care system to treat chronic disease as aggressively as it does now. The major U.S. stock indexes begin a new week hugging all-time highs. The Dow is up slightly, the S&P 500 and Nasdaq down slightly. More noteworthy, today at least, is Japan’s Nikkei average. It’s been rising steadily for six weeks and today it jumped 1.1%, to its highest level since 1996 — thanks to a sweeping election victory by the party of Prime Minister Shinzō Abe. Abe’s win signals more easy-money policy from Japan, which is weakening the yen and strengthening the dollar today. That dollar strength has knocked another five bucks off the gold price; the bid is now $1,274. The only economic number of note today is the Chicago Fed National Activity Index, which has been a reliable predictor of recessions for nearly 50 years. And while the number is on the weak side this morning, it’s nowhere near recession territory. 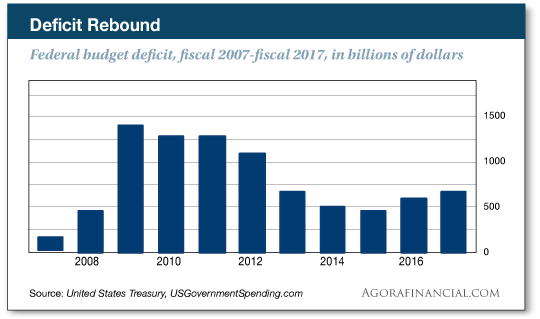 Behold the demon deficit: Uncle Sam ended fiscal 2017 another $666 billion in the red. That’s according to the U.S. Treasury’s final numbers for the fiscal year, out last Friday. Total federal spending reached nearly $4 trillion, but tax receipts totaled only $3.3 trillion. Tax receipts rang in higher than the year before but lower than the record 2015. And that’s before interest rates start moving up and Uncle Sam has to start shelling out a lot more for debt service. Then again, maybe the powers that be will keep interest rates perpetually low for that very reason — which doesn’t bode well for fixed-income investments. “This could have turned into a worst-case scenario,” says an understandably anonymous Amazon customer from Orlando. The woman and her fiancé had ordered some 27-gallon storage bins. Instead they got a 65-pound shipment of marijuana. They called police, who are now investigating. Meanwhile the couple says they’ve gotten little satisfaction from Amazon — a $150 gift card, but no apology or explanation. “We were still pretty fearful our home would be broken into, and we didn’t sleep there for a few days,” the woman tells the local ABC affiliate. For sure. It’s not uncommon in the illegal drug trade for criminals to mail drugs to innocent people, with plans for someone to snag the package from the doorstep before the innocent party claims them. The couple is luckier than they realize. We recall the case of Cheye Calvo, the mayor of Berwyn Heights, Maryland. Sheriff’s deputies raided his home in 2008 — holding him and his mother-in-law at gunpoint, shooting and killing their two dogs. It turns out police had intercepted a 32-pound package of pot addressed to Calvo. The SWAT team left it on his doorstep, staked the place out and then barged in when Calvo pulled the package inside. Of course upon further investigation it turned out Calvo was no drug kingpin, and the cops had botched the investigation from start to finish; Calvo settled out of court in 2011 for an undisclosed amount of money. We got a little activity in the virtual mailbag after our item Friday about how social-justice warriors object to the term “taxpayer money”… but it wasn’t what we expected. “A little context please,” says one. “Vice President (and former Indiana Gov.) Pence was invited months ago to attend the game in Indianapolis when they retired Peyton Manning’s number. The overhyped war over kneeling wasn’t a big issue until only a couple of weeks earlier, following Trump’s remarks. “Problem is you can’t do anything now without some criticism. ‘Taxpayer money’ is only an issue when the other guy is ‘wasting’ it. The 5: The federal government in general, and the executive branch in particular, has gotten way too big and powerful to justify the personnel and expense entailed in “protecting” it. One summer day in 2011, The 5 took note of a Barack Obama bus tour around the Midwest, and its rather imperial nature. It’s worth watching the video of the whole thing as it passed through Zumbrota, Minnesota — population 3,252. That armored bus? It cost $1.1 million. We’re a long way from the day when the British ambassador to the United States knocked on the door of the White House and President Thomas Jefferson answered it himself — in house slippers. P.S. Just in case you missed it… we sent many of you an urgent customer-service alert on Friday and again today. Our customer care director explains all during a three-minute video at this link. Please note that today is your last chance to make the change to your account that he describes.